Cast of a fluted point preform from the Sugarloaf site. 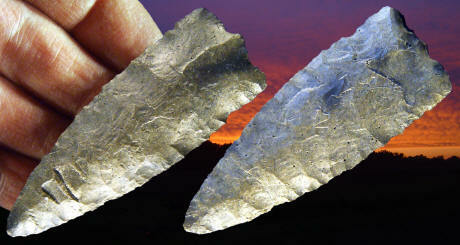 Two sizes of fluted projectile points were manufactured at the monumental Sugarloaf encampment in the Connecticut River Valley, central Massachusetts. The largest size, ranging from 125 mm to 175 mm in length (5-7 inches), may have tipped lances; while, small fluted points such as the one here, may have been intended for affixing to javelins. Both varieties could have been used against caribou quarry during their annual migration to and from calving grounds. Despite the care an ancient knapper took to create a nippled striking platform, a long channel flake was not produced and the artifact collapsed near the tip leaving a short compression fracture (hinge) on either side of the snap. Failure may have occurred because of a flaw in the raw material, which is Normanskill chert. Sources of this chert, often badly jointed, lie within the Hudson River valley 100-150 km west of the Sugarloaf site. Both fragments of this fluted point (SLF-40, SLF-59) were unearthed during September, 2013 excavations at the Ulrich Locus of the Sugarloaf site, where as many as 150 fluted points were successfully produced. The age of the Sugarloaf occupation is 12,350 +/- 50 calendar years before present, marking it as a descendant Clovis manifestation. This point measures 3 inches (7.6 cm) long.